Several recent farmdoc daily articles (July 12, 2017; July 19, 2017; July 26,2017; August 9, 2017; August 16, 2017) examined the role that biomass-based diesel (BBD) plays with respect to compliance with RFS mandates. Topics covered include: 1) the amount of BBD required to fill the BBD mandate and also fill the advanced and conventional gaps, 2) identifying and estimating BBD supply curves, and 3) implications for BBD prices of alternative policy scenarios. The latest analysis suggests that the imposition of an antidumping duty that restricts BBD imports from Argentina and Indonesia would add about $0.15 per gallon to the average price of BBD in 2018. A natural extension of this work is to examine the potential impact on D4 biodiesel RINs prices of alternative policies. There is substantial interest in RINs prices because they represent the marginal cost of complying with the RFS mandates. 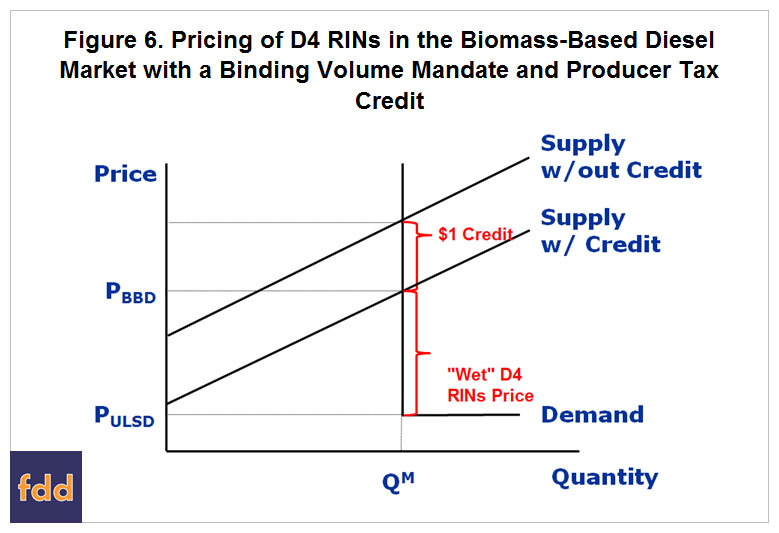 Understanding biodiesel RINs prices is especially important because BBD is the “marginal” gallon for filling both the advanced and conventional ethanol mandates. 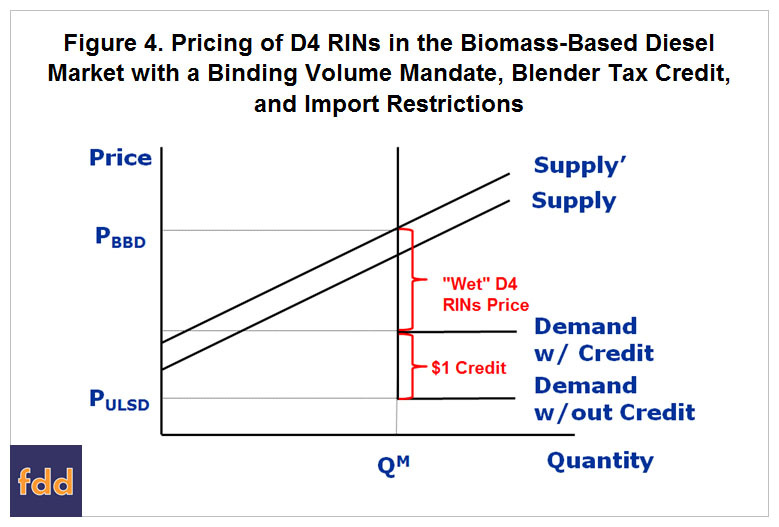 In this article we examine how to logically think through the impact on D4 biodiesel RINs prices of alternative policies currently under consideration, including the restriction of BBD imports, increasing RFS BBD requirements, and converting the blender tax credit to a producer tax credit. We also test how well this logical framework predicts biodiesel RINs prices. 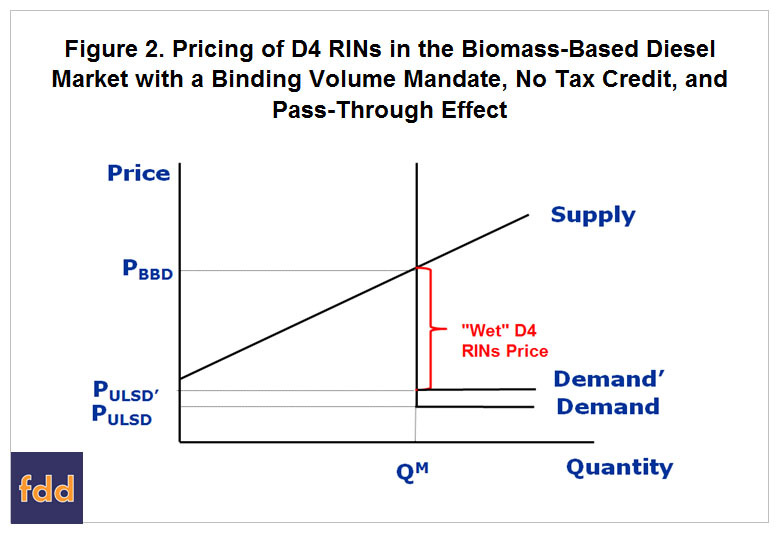 Our analysis is based on an economic model of biodiesel RINs pricing that has been, in one form or another, used in a number of earlier articles on RINs pricing (e.g., farmdoc daily, April 5, 2017). The model shown in Figure 1 represents the supply of BBD producers and demand from diesel blenders at the wholesale level in a competitive market. It is important to note that supply represents the total of domestic and imported production. Retail demand at the consumer level is implicitly represented by a simple percentage markup of the wholesale demand shown in Figure 1. This implies full pass-through of wholesale price changes to the retail level. The model assumes an L-shaped demand curve, with the vertical and perfectly inelastic portion equal to the fixed RFS volume mandate and the horizontal perfectly elastic portion above the mandate equal to ultra low sulfur diesel prices. This reflects an assumption that BBD and petroleum diesel are perfect substitutes after adjustment for the lower energy value of most BBD. Note that in the absence of an RFS mandate the demand curve is simply a horizontal line equal to the diesel price. As usual, equilibrium is found where the supply and demand curves intersect, which here is the point (PBBD, QM). PBBD = PULSD + D4. So, at the producer level the price of BBD equals the diesel price plus the RINs value. BBD traded at a later stage of the supply chain may not have the RINs attached, and if so, the price should be the diesel price adjusted for margins at that stage. In the equilibrium shown in Figure 1 it appears that diesel blenders absorb a large loss equal to the D4 RINs cost given by the area (PBBD – PULSD) x QM. This reflects the fact the purchase price of biodiesel (PBBD) is substantially higher than the selling price (PULSD) at the mandated volume. However, this ignores the intricacies of the pass-through part of the model, where the additional cost is passed on to consumers at the pump in the form of higher diesel prices. After appropriate weighting for the proportion of BBD in the blend (e.g., B2, B5), this is shown in Figure 2 as the increase in diesel prices from PULSD to PULSD’. This has a feedback effect on the D4 RINs price, reducing it slightly compared the equilibrium without consideration of pass-through. This highlights the simultaneous nature of the determination of D4 RINs and diesel prices in this model. Also, notice in Figure 2 that the producer price and quantity of BBD is unaffected by the increase in diesel prices. The only difference between Figures 1 and 2 is who pays for the additional cost of biodiesel above the price of diesel, which is the same thing as the RINs price. In this version of the model, consumers ultimately bear the higher cost of BBD in the form of higher diesel prices. The available evidence indicates this is a reasonable assumption for many but not all areas of the U.S. See the recent studies by Knittel, Meiselman, and Stock (2015) and Pouliot, Smith, and Stock (2017) for detailed analysis of RINs pass-through to pump prices. We can now consider the impact on D4 RINs prices of the first alternative policy scenario. 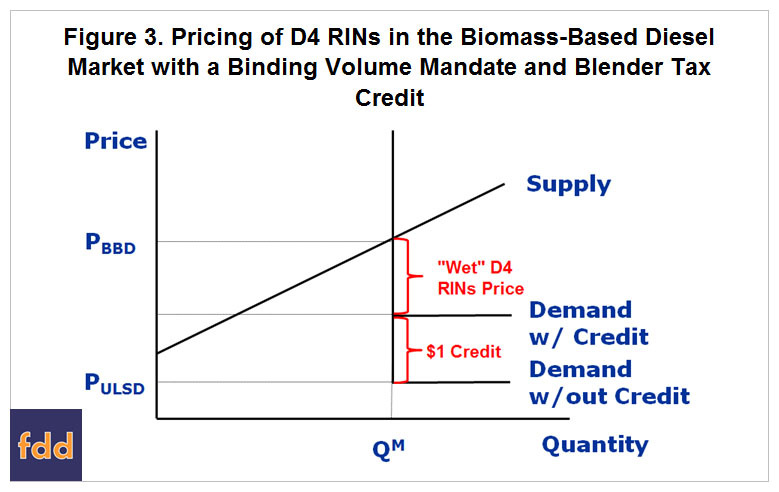 Figure 3 shows RINs price determination with a binding volume mandate and a $1 gallon blender tax credit. Note that for simplicity we assume in this and the analyses to follow that the demand curves and diesel prices reflect pass-through effects of RINs values. The model accounts for the tax credit by shifting the BBD demand curve up by the amount of the credit. In other words, at any given quantity of BBD, the effective demand price for BBD is increased by the $1 tax credit. This directly reduces the price of the D4 RINs by the amount of the credit so that the equilibrium “wet” D4 RINs price becomes PBBD – (PULSD + 1). It is also important to emphasize that the effect of the tax credit under this scenario is purely distributive because the producer biodiesel price and production are unaffected by the credit. Hence, the total wholesale cost of biodiesel (and revenue of biodiesel producers) is given by PBBD x QM. The cost of biodiesel above the cost of diesel is split between taxpayers [$1 x QM] and blenders [(PBBD – (PULSD + 1)) x QM]. The latter term is the blender RINs cost in this model and it is again assumed to be passed through in the form of an appropriately weighted increase in the price of diesel. So, consumers ultimately bear the additional cost of biodiesel above diesel not borne by taxpayers. Figure 4 incorporates a policy of restricting BBD imports to the U.S. along with a binding volume mandate and blender tax credit. This scenario reflects the possibility of restricting BBD imports from Argentina and Indonesia due to an antidumping and countervailing duty petition filed by U.S. producers with the U.S. Department of Commerce and the International Trade Commission in March 2017. If the petition is successful we assume this has the effect of eliminating BBD imports from Argentina and Indonesia and thereby shifts the supply curve up and to the left. This has the straightforward effect of raising the producer BBD price and the D4 RINs price. Figure 5 considers a scenario where imports are unrestricted, a blender tax credit is in place, and the volume mandate is increased. This reflects the possibility that future mandate volumes could be increased to “backfill” earlier volumes that were reduced based on the EPA’s interpretation of its “inadequate domestic supply” waiver authority. A U.S. Appeals Court recently invalidated EPA’s interpretation (farmdoc daily, August 9, 2017; August 18, 2017). This simply shifts the demand curve to the right and increases the BBD producer price and the D4 RINs price. The final policy scenario we consider is a constant volume mandate, no import restrictions, and conversion of the biodiesel tax credit from a blender to a producer credit. The conversion would mean that only domestic U.S. BBD production would be eligible for the $1 per gallon credit, effectively putting the U.S. on a biodiesel “island.” More technically, this would mean that total available supply is limited to domestic supply. In Figure 6 this is reflected in the shift upward and to the left of the supply curve without the credit. Since producers receive a $1 per gallon credit in terms of their Federal tax liability, this effectively lowers the supply price of BBD producers at each level of quantity and shifts the supply curve back down and to the right. The demand curve is unaffected because producers collect the tax credit rather than blenders. The equilibrium “wet” D4 RINs price with a producer tax credit becomes (PBBD – 1) – PULSD. All else equal, the conversion will increase the D4 RINs price compared to the scenario with a blender tax credit in Figure 3. The higher RINs price reflects the fact that production is limited to domestic suppliers. The conceptual analysis in the previous section highlights the wide-ranging impact of different policies on D4 RINs prices. However, D4 prices in all of the scenarios share a common and simple structure. With a blender tax credit, the predicted price is D4 = PBBD – (PULSD + 1) and with a producer tax credit it is D4 = (PBBD -1) – PULSD. Since the tax credit to date has always been a blender credit the first relationship can be used as a model to predict historical D4 RINs prices. To test this simple model we collect weekly (Thursday) biodiesel prices and ultra low sulphur diesel prices at Chicago and compute predicted D4 prices. We assume that Chicago is roughly representative of the U.S. and compare predicted prices to national average D4 RINs prices. The biodiesel, diesel, and D4 price series are all collected from OPIS. The biodiesel and diesel price series begin on January 25, 2007 and the D4 price series begins on September 3, 2009. The latest available date for all three weekly series is August 17, 2017. We adjust biodiesel prices to reflect the lower energy value of most BBD compared to petroleum diesel. This has the effect of raising the biodiesel price about eight percent. Our previous empirical analyses of D4 RINs prices did not make this adjustment. We also account for the $1 per gallon tax credit when it is in place. Due to the on and off again nature of the credit, it was only in place during 2007-2009, 2011, 2013, and 2016. The credit was restored retroactively for 2010, 2012, and 2014-2015, but has yet to be restored for 2017. Finally, we assume that diesel prices fully reflect RINs pass-through costs so it is not necessary to account for this in the model. 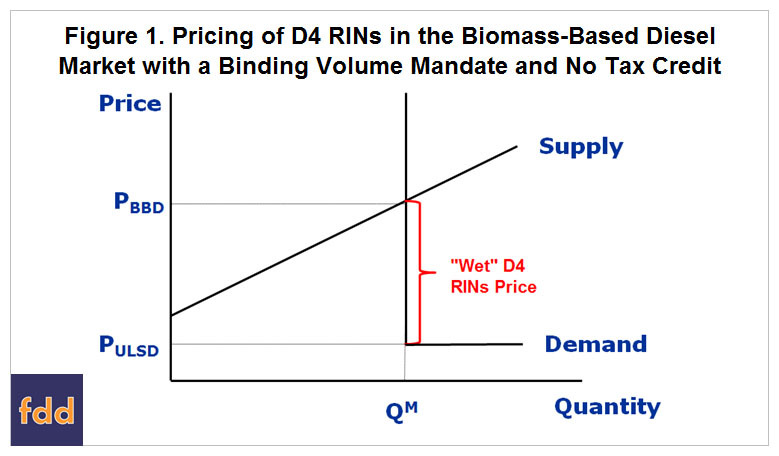 Figure 7 contains a plot of the predicted and actual D4 biodiesel RINs prices. In general, the predicted price tracks the actual price reasonably well. There are some notable periods where the predictions differ substantially from the actual, particularly 2010, 2015, and 2017. We can observe that predicted D4 prices in these years were almost uniformly higher than actual prices. As we have noted in previous farmdoc daily articles (e.g., October 10, 2014), this can be explained as the RINs market anticipating that the tax credit in these years will be restored retroactively. The gap between the predicted and actual D4 prices in these circumstances reflects the probability that the market thinks the tax will be restored retroactively. When the gap is large the market thinks that the probability of retroactive restoration is high, and vice versa. In order to provide a test of the predictive model that is not confounded by changing market expectations of the tax credit being restored retroactively, we limit the analysis to the years when the credit was in place within the calendar year. There are only three full calendar years during this sample period when this was true–2011, 2013, and 2016. Figure 8 provides a scatter plot of the model D4 predictions versus actual prices for these three calendar years. The results suggest two important findings. First, the R2 for the regression of predicted prices on actual prices is 0.77, indicating that the variation in predicted prices explains most of the variation in actual prices. The fit is certainly far from perfect though, with some errors exceeding $0.25 per gallon. Second, the regression intercept and slope indicate that the predicted price on average equals the actual price. More technically, unbiasedness requires that the intercept in the regression equals 0 and the slope equals 1. The estimated values are quite close to these benchmarks. 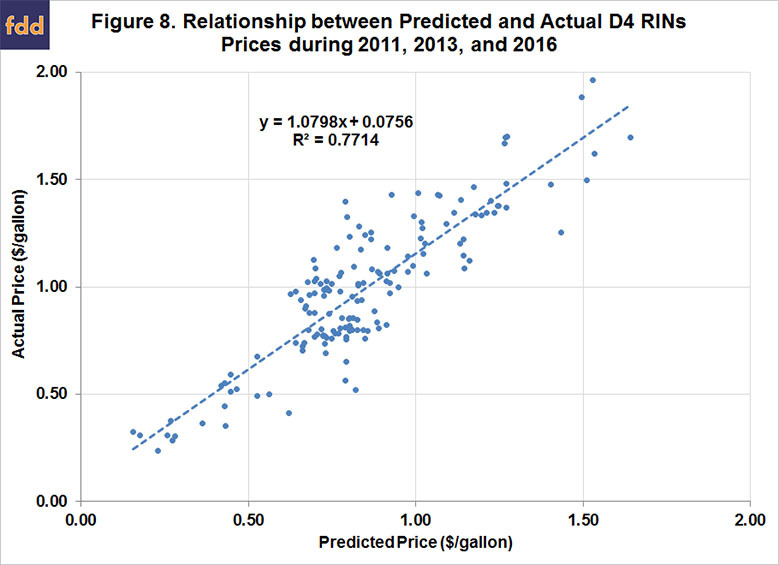 In sum, the data for years without uncertainty about retroactive reinstatement of the biodiesel tax credit show that the simple predictive model for D4 RINs prices performs quite well as a valuation benchmark. 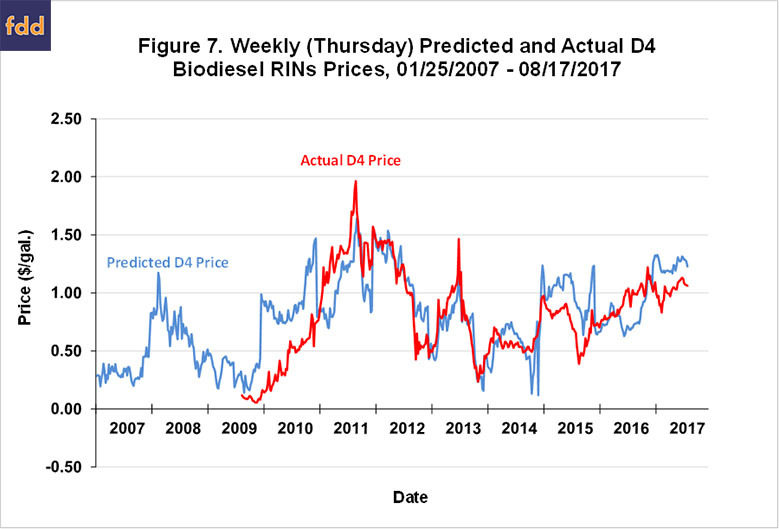 This simple model is also an improvement over our previous attempts to predict biodiesel RINs prices (e.g., farmdoc daily, October 10, 2014). We previously modelled biodiesel RINs prices using the analog of option intrinsic value and time value. After adjusting biodiesel prices for the lower energy content of biodiesel compared to diesel and limiting the sample to years with the tax credit in place, it is not necessary to consider a time or “speculative” value for biodiesel RINs. The unbiased nature of model predictions in Figure 8 indicates that intrinsic value (current blending margin) is sufficient to capture the bulk of the variation in actual D4 RINs prices. There is no shortage of evidence that RINs pricing is poorly understood by many market observers, policy makers, and even some market participants. Charges of manipulation and unbridled speculation in the RINs market are made with alarming frequency. This is almost certainly compounded by the changing array of policy alternatives under consideration at any point in time. Here, we show that a relatively simple supply and demand model for biomass-based diesel (BBD) can be used to work through the expected impacts of different policy scenarios. 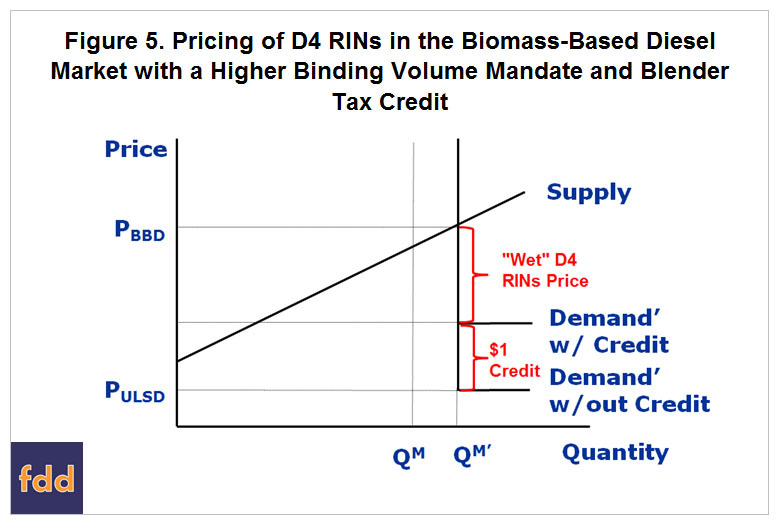 The analysis also leads to a very simple model to predict D4 biodiesel RINs prices based on biodiesel prices, diesel prices, and the biodiesel tax credit. Our empirical analysis using historical data shows that the simple predictive model performs quite well as a D4 valuation benchmark. Next week, we will use this valuation framework to project future biodiesel RINs prices under several policy scenarios, including the restriction of BBD imports, increasing RFS BBD requirements, and converting the blender tax credit to a producer tax credit. Coppess, J. "Upon Further Review: The Decision on EPA's RFS Waiver Authority." farmdoc daily (7):151, Department of Agricultural and Consumer Economics, University of Illinois at Urbana-Champaign, August 18, 2017. Irwin, S. "Blender and Producer Sharing of Retroactively Reinstated Biodiesel Tax Credits: Time for a Change?" farmdoc daily (7):62, Department of Agricultural and Consumer Economics, University of Illinois at Urbana-Champaign, April 5, 2017. Irwin, S. "Implications of Changing the Biodiesel Tax Credit from a Blender to a Producer Credit." farmdoc daily (5):142, Department of Agricultural and Consumer Economics, University of Illinois at Urbana-Champaign, August 5, 2015. Irwin, S. "Understanding the Behavior of Biodiesel RINs Prices." farmdoc daily (4):196, Department of Agricultural and Consumer Economics, University of Illinois at Urbana-Champaign, October 10, 2014. Irwin, S and D. Good. "Biomass-Based Biodiesel Prices--How Much Does Policy Matter?" farmdoc daily (7):149, Department of Agricultural and Consumer Economics, University of Illinois at Urbana-Champaign, August 16, 2017. Irwin, S. and D. Good. "EPA Interpretation of the "Inadequate Domestic Supply" Waiver for Renewable Fuels Ruled Invalid: Where to from Here?" farmdoc daily (7):144, Department of Agricultural and Consumer Economics, University of Illinois at Urbana-Champaign, August 9, 2017. Irwin, S and D. Good. "Revisiting the Estimation of Biomass-Based Diesel Supply Curves." farmdoc daily (7):135, Department of Agricultural and Consumer Economics, University of Illinois at Urbana-Champaign, July 26, 2017. Irwin, S and D. Good. "Filling the Gaps in the Renewable Fuels Standard with Biodiesel." farmdoc daily (7):130, Department of Agricultural and Consumer Economics, University of Illinois at Urbana-Champaign, July 19, 2017. Irwin, S and D. Good. "The EPA's Renewable Fuel Standard Rulemaking for 2018--Still a Push." farmdoc daily (7):125, Department of Agricultural and Consumer Economics, University of Illinois at Urbana-Champaign, July 12, 2017.